Apparently Twinkies are no longer Kosher (I never ate them anyway), and I’m not sure if any of the Minyan keeps Kosher, but let’s see how our (matzo) ballplayers did yesterday! Brad didn’t play in the Dodgers loss to the lowly Nationals. 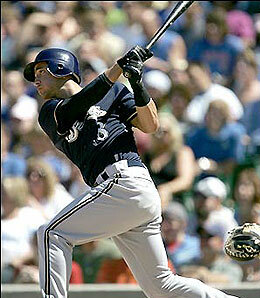 Ryan went 2-for-4 and scored 2 runs in the Brewers loss to the Reds. He raised his average to .327. Craig didn’t pitch in the Twins loss to my Orioles. Scott, who won his second game of the year on Wednesday, didn’t start and chilled on the bench while watching the Rangers lose to the A’s. John didn’t pitch in the Pirates loss to the Cardinals. Gabe went 1-for-4, with a stolen base, his second, in the Rays victory over the Yankees. He is now batting .214. Ian went 1-for-4, in the Rangers loss to the A’s, hitting his 9th double of the year. His average fell to .325. Jason took the loss in yesterday’s start against the Giants. He pitched 6 inninings, gave up 7 runs (5 earned), 8 hits and was twice victimized by Giants catcher Benjie Molina, who blasted a solo homer and a 2-run shot. His record fell to 4-2 and his ERA rose to 3.92. Marquis had been 5-0 lifetime at Coors Field before the loss. Molina had been hitless in 12 career plate appearances against Jason. Scott pitched 1/3 of an inning, walking a batter and getting the other one to line out in the D-backs loss to the Padres. He lowered his ERA to 2.16. Youk didn’t play in the Red Sox win over the Indians due to continuing muscle soreness in his left side. As a Rockies fan, Jason’s loss was pretty hard. He’s been the star pitcher of the Rockies and that was a bad beat.